I love webcomics. I think Ozy and Millie is better than Calvin and Hobbes. I’m shocked that studios haven’t secured the rights to comics like Questionable Content, Something Positive, or even XKCD (wouldn’t that pair up well with Big Bang Theory). And for years I’ve been following the hilarious but slowly-told story of Sabrina Online. But despite all the webcomics I read, I’ve never taken the time for Phil and Kaja Foglio’s Girl Genius. I’d certainly heard of it; it just hasn’t yet found its way into my Google Reader. 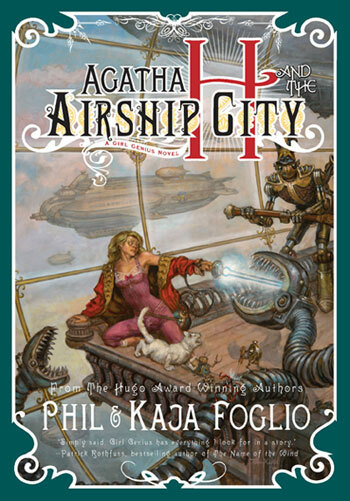 So I think that makes me the right kind of person to review Agatha H. and the Airship City, by Phil and Kaja Foglio*. I mean, I had no idea that this was a “Girl Genius” novel to begin with, after all, until I actually received the book. The novel retells the origin story of Agatha Clay, a young woman living in Transylvania in an alternate, steampunk style of Europe. “Sparks” — basically supervillains — held the continent in their grasp until Baron Wulfenbach showed up to impose order by any means necessary. When he and his son, Gilgamesh, show up at the University where Agatha works, a fight in the lab leads to Agatha’s mentor being killed and Agatha herself going on the run. Soon, though, she is captured by the Baron and brought to his castle, where she finds out that the world isn’t as black-and-white as she thought, and neither is the Baron. I would say that, if this book suffers in any way, it’s that some humor conventions of webcomics just don’t translate into print all that well. Take, for example, the scene where Agatha and Gilgamesh are on an out-of-control flying machine. In a webcomic, you can have an entire conversation over the course of a strip or two while the heroine is plummeting to her death. But in the novel, it seemed as though they should’ve hit the ground long before Agatha attempted to fix the machine. Another instance: the underwear gag. I’ve seen it used quite successfully on television and in other comics, but after the shock of its first appearance, future ones felt somewhat forced. But while those parts didn’t work, the rest of the book certainly did. I laughed a lot, and I definitely empathized with the characters — although one does pull a heel turn that I wasn’t expecting and really didn’t understand the point of, except to move the plot along. The fight scenes were well-written and well-choreographed, from Agatha’s swordfight with the princess to Von Pinn taking on a pirate queen to the Baron himself against the Slaver Wasps. A few genre conventions are turned on their heads (isn’t that right, Princess? ), while others (like Agatha’s physical shape) are cheerfully indulged. Toward the end, the book got really quick to read, and each time I turned the page I wondered how everything was going to get wrapped up. I felt like maybe there was room for another chapter, like the ending needed a little something more to be fully satisfying… but then, there’s plenty more to be written, especially if further adventures of Agatha are to be retold as novels. And hey, if not, I can always read the comics. Overall, I like I said, the book was a lot of fun to read. I got through it fairly quickly, owing to the fast pace and the desire to find out just what the hell is happening to Agatha. Plus, the nuanced nature of the Baron added a layer to the story that some adventure novels just can’t pull off. Agatha H. and the Airship City is worth reading, and — at least, in my case — it got me interested in the Girl Genius comic as well. After all, I have to know what happens next. * For some reason, I feel like I’m used to seeing them credited as “Kaja and Phil Foglio”, so it seems weird to type it the other way. But Phil’s name comes first on the cover, so that’s how I’m putting it here.